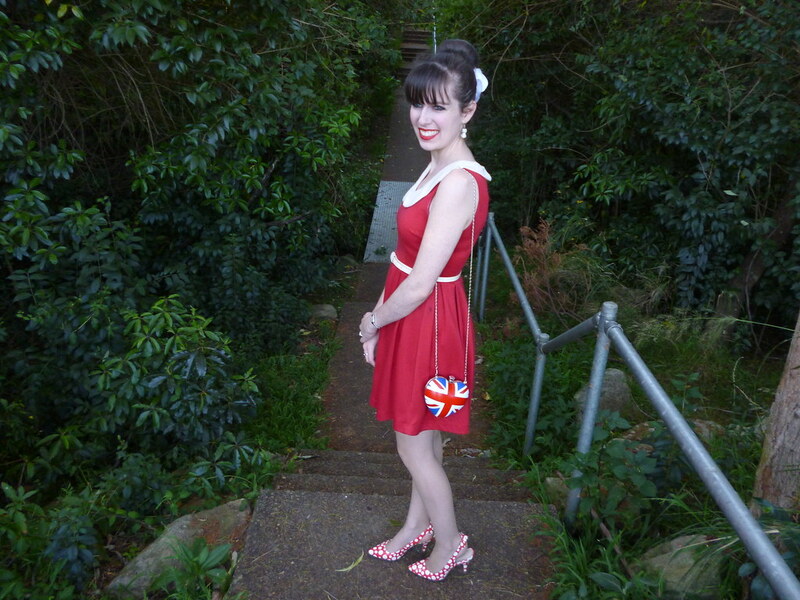 This has been one of my favourite and most reliable dresses over the years and one which I know a few other bloggers own too (including my beautiful friend Jamie from Petite Panoply). I first posted it here (and for those of you who’ve asked if I ever have a different hairstyle, here is proof that I did once upon a time). I just love the feeling of wearing a dress for the first time in a particular season; it’s only recently been warm enough to wear this so it almost feels like a new dress. I call this my ‘Annie dress’ and these are my ‘Minnie Mouse’ shoes’ as many of you pointed out in my post here; Annie and Minnie Mouse make an obvious combination, surely?! 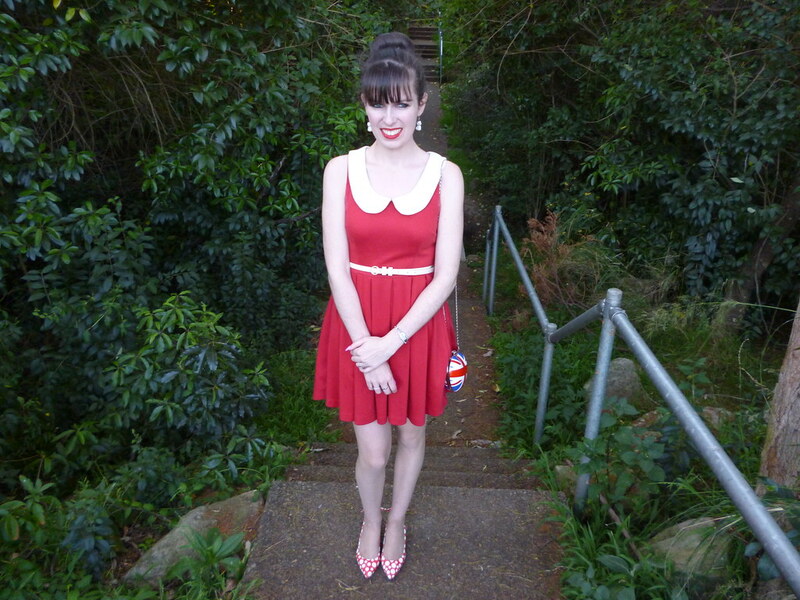 I have a number of red and white shoes so I’ve always been lucky with matching shoes to this dress. 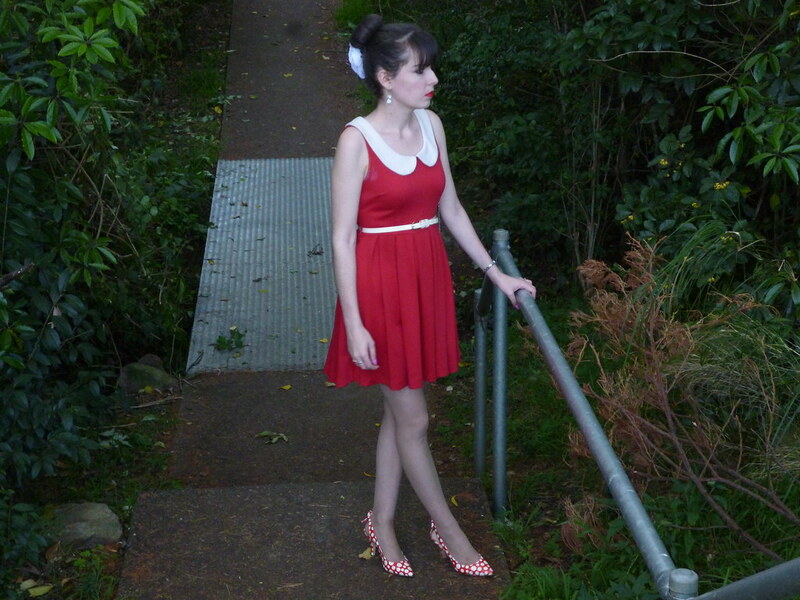 Isn’t the peter pan collar on this dress the loveliest finish too? For some reason I always pair my union jacket handbags with this particular dress; I like to wear small amounts of different patterns in an outfit. As much as I adore this bag, I do wish it would actually fit my phone. In other news…I’m starting a new job tomorrow. I couldn’t be happier to have an opportunity so soon as leaving my previous job; even though I was only unemployed for a week and a half between jobs I was so bored and felt rather negative about life again. I still miss my other job and it will always have a special place in my heart. The only downside to my new job is that I’ll be spending about 15 hours a week on the bus (I used to think 10 hours a week at my last job was a lot) so I’m definitely relying on you to keep me entertained during that time. I’ll use the time to catch up on your blogs and write my posts. 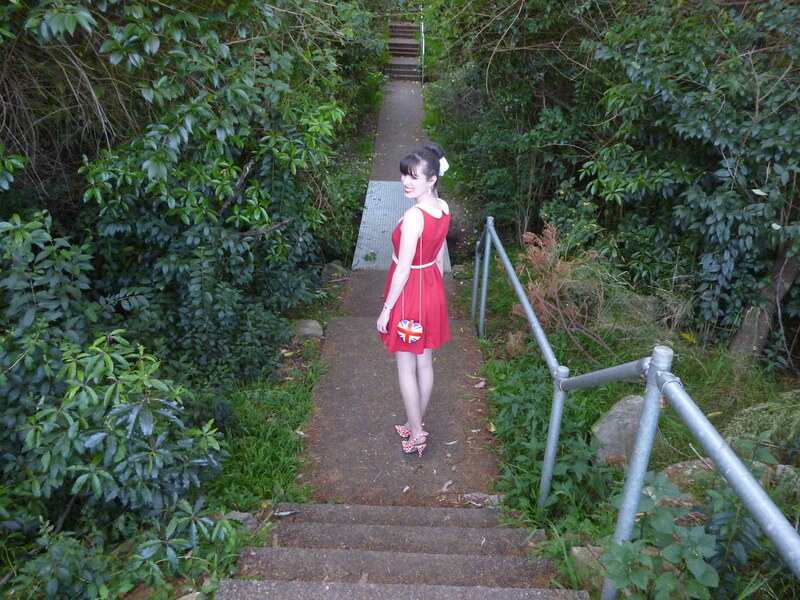 This entry was posted in Dangerfield, Florsheim, Modcloth, Outfits. Bookmark the permalink. Lovely your dress and shoes! Your collection of dresses is so impressive, this is yet another stunning piece I love to bits! Wow, that's a long time on the bus! Cute dress today, the collar is so fun. That dress in many ways is a classic. I can see why you like it so much. So happy to know that you got a new job , just in time before you feel tooo negitive…. Loved the look , you look like a doll….. This dress is really fantastic and your accessories make it even more special! I mean seriously, the bag and the shoes are just out of this world amazing! Oh yeah! I forgot to congratulate you on your new job! Congrats! Lovely dress and amazing accessories!!!! How pretty this dress is, I'm sinoly in love! You look adorable) Those photographs are also great! I wish you lots o luck with your job, I nknow how important it is nowadays! Such a pretty and stylish look! Love the colors! Great photos! Thank you for stopping by! This is such a cute outfit on you. I have always loved the color RED in fashion. The shoes are so stylish, and I love the purse! This outfit is put together so beautifully. Aww, love it. 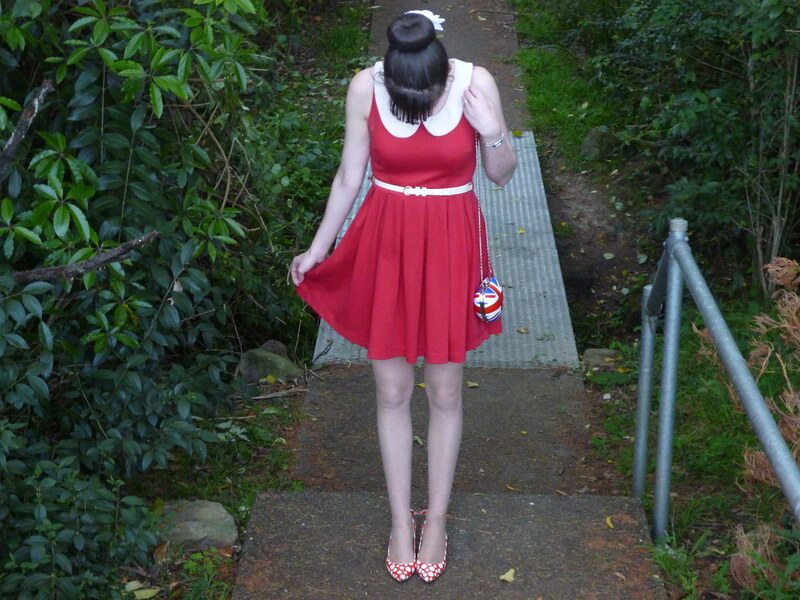 The dress, the lovely collars, ooh yours shoes and that bag…please and thank you :). Stunning! Adorable as always! Beautiful. Love this color combo — red is awesome on you! 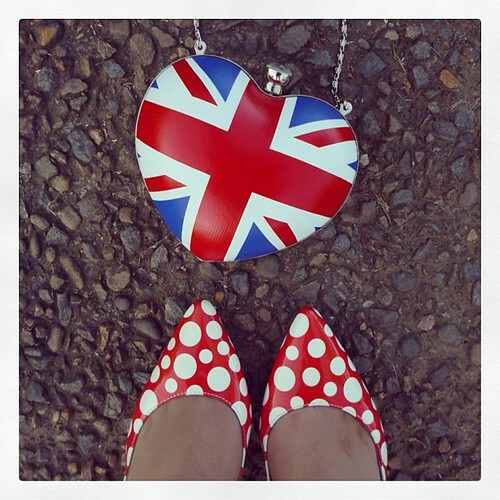 Perfect red dress, and the pop of polka dots and british flag fabulous. Much love and happy weekend, dear Imogen.